Pings from Mybloglog is it a Good Incoming Links ? I have been seeing Pings from Mybloglog lately, and the more sociable I become in Mybloglog the more Pings I received. So is this links adding up to the Link Power of this blog. Well I still believed that Ping is a Ping wether it comes from Mybloglog or from other site, it is still considered as an incoming links. The only problem is if those links will be better on SERP than the Original post, and there you have a problem. I am now thinking in putting back my mybloglog widget. But Still i have to check if this will slowdown loading my site. 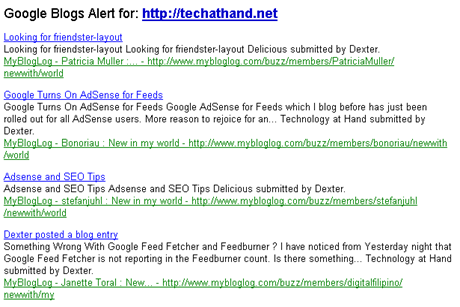 Do you see the same in your Google Alerts ? Jehzeel Laurentes last blog post..How To Lose Four Inches of Fat in Just Two Weeks? Dexter | Tech At Hand Dot Nets last blog post..Pings from Mybloglog is it a Good Incoming Links ?